This is truly a delightful book, full of interactive moments. So many children’s stories are absolutely appalling for an adult to read more than once (and their favorites get read over and over (and over) again). 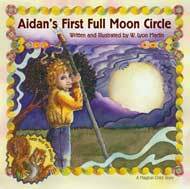 Aidan's First Full Moon Circle is a wonderful story. There is a strong sense of "Where's Waldo" in the Seamus the Squirrel game throughout the entire book (which children love). The story’s “moral” is the ever-useful one of accepting responsibility and being open to new experiences. As a bonus for us Pagans, the story imparts the basics of Wiccan ritual without going deeper than what the average child can understand. There’s a useful glossary of Craft terms used throughout the book and – my particular favorite -- a list of teachers guides for more learning. Let’s not forget the gorgeous illustrations. Full of rich colors and friendly faces, each page is a delight. Lyons is the author of An Ordinary Girl, A Magical Child, which I am going to recommend, sight unseen because of the excellent of Aidans’.